Last week we headed to the iNACOL Blended and Online Learning Symposium in San Antonio for 4 days of leading workshops, making connections, catching up with old friends and meeting new ones. Our booth was filled with good discussions about the many paths to personalized learning, as well as some pretty awesome photo opportunities with our blue roadtripping beetle. 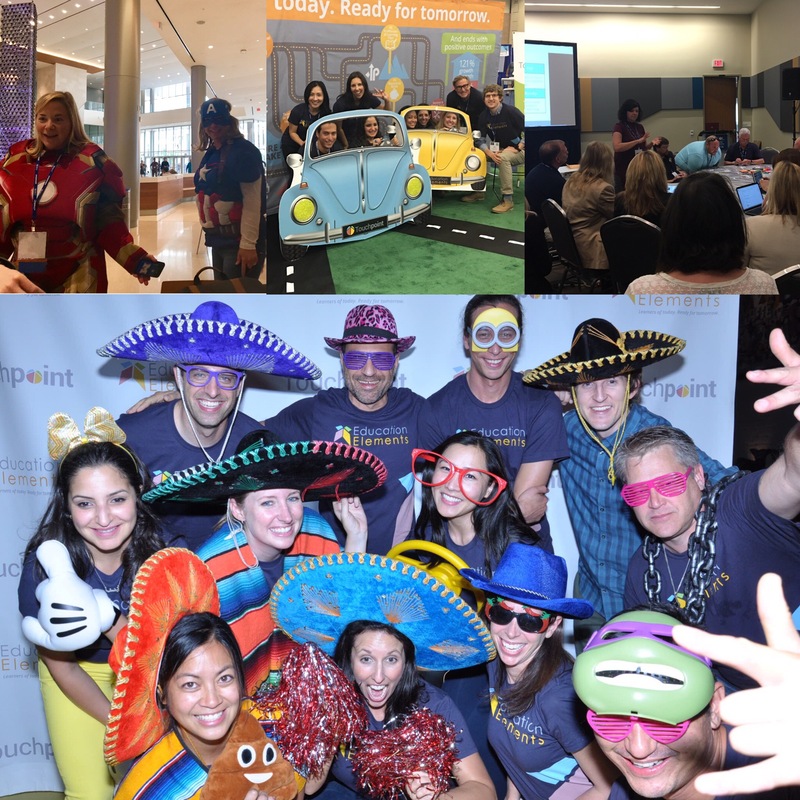 On Wednesday night between a competitive mojito-making contest and some great moves on the dance floor to a live merengue band we announced the launch of Touchpoint, our new tool which complements our consulting services and puts teams on the same page. It was a terrific week! We are so proud to announce the launch of Touchpoint. As a complement to the support we already provide to school districts we created Touchpoint, an online tool, because we believe that for change to be successful, everyone needs to be aligned. Touchpoint provides one single source of all the information, resources and timelines districts need to manage the many moving parts of big system-wide change. Designed to help leaders map and track progress, Touchpoint supports school teams as they design experiences that meet the needs of students and allows district teams to easily onboard new waves of school and staff to the initiative. Want to learn more about it? Check out coverage of Touchpoint here or email info@edelements.com to set up a demo. We are thrilled to start working with Fairbanks North Star Borough School District in Fairbanks, Alaska! Fairbanks has selected Education Elements as the technical provider to begin their work to develop a strategy and implement personalized learning across 28 schools; with 19 schools scheduled to launch next fall. We are a little wary about the winter up there, but can’t wait to get started. The jump from vision to design can be daunting. Personalizing learning is an exciting frontier, and though the destination may seem clear, the road is still being charted. And as every district and school continues to take its own unique path to personalization, it's common to feel lost in the instructional design process. Making the connection between a district’s vision and its classroom practices is a critical step we support districts in taking. To bridge the gap between 10,000-foot visions and in-the-weeds instruction, we recommend selecting guiding instructional strategies that embody your district’s vision. These strategies should be broad enough to encapsulate your definition of personalized learning, while specific enough to act as clear and actionable parameters for design. At Education Elements, we’ve developed the Core Four, and districts often elect these as their guiding strategies. Once in place, teams can make informed decisions around classroom models and teacher tactics. School District 197 in Minnesota is one of our partner districts in the midst of this instructional design. Last year, a team of district administrators, school leaders and teachers worked to learn about personalized learning, develop a district-wide vision, and construct a five-year roadmap. This year, a team of 20 ‘Vanguard’ teachers from each of the district’s eight schools formed a design team to determine personalized learning models models and tactics to test in the 2016-2017 school year. Joined by school and district administrators, the design team’s goal is to construct a portfolio of models to be used district-wide in the years to come. District leadership aligned on the Core Four: Data-Driven Decisions, Integrated Digital Content, Student Reflection and Ownership, and Targeted Instruction. The design team of 20 teachers, 8 school leaders, 10 district administrators divided into six groups, each focusing on specific grade bands. Each group aligned on grade-appropriate personalized learning instructional tactics within the guiding PL strategies. Individual or pairs of teachers determined which tactics to focus on in their classrooms. Teachers designed instructional models - drawing inspiration from models including blended stations rotations, flexible playlists, and flipped instruction - that supported their selected classroom tactics. Thoughts on instructional design? Tweet it to us @edelements #vision for #personalizedlearning. Want support in designing personalized learning models within your district? Let us know! BYOT (Bring Your Own Thoughts)! Do Our Students Deserve It? Education Elements is hiring! Check out our careers page and join our team of people who are passionate about personalized learning! Check out how personalized learning impacted our students, teachers and district leaders! District Administrator Leadership Institute (DALI), Nashville, TN Nov 2-4: Superintendents gather to discuss innovative solutions and build relationships. League of Innovative Schools Summit, Baltimore, MD Nov 3-4: Digital Promise will bring together the League of Innovative Schools comprised of pioneering districts across the country. Ed Elements will spend an extra day with a select group of districts working on competency-based education. Lexington Education Leadership Award (LELA) Celebration, Washington DC, Nov 8-10: The culminating celebration of the LELA award, a fellowship program for superintendents committed to implementing personalized learning. Association of Education Service Agencies National Conference, Savannah, GA Nov 30-Dec 3: Service centers from every state gather to share best practice in supporting districts and schools. Chicago Blended Learning Forum, Chicago White Sox Stadium, Chicago, Illinois Nov 17: Education Elements is hosting 30 districts for a deep dive into how personalized learning can support learners of today. Want to meet up at an event? Email amy@edelements.com and tell us where you will be! Education Next: Are Students Buying What We’re Selling? Subscribe to our blog and make your Wednesdays better! The Personalized Learning Summit 2017 registration is now open. Register now and power up for tomorrow! You received this email because you are subscribed to Newsletter from Education Elements.